Developing a B2B SEO keyword strategy is no easy feat. Considering the fact that Google receives more than 70,000 searches every second, it can be tough to understand exactly what customers are looking for. What we do know is this: All of your potential customers are entering keywords into the Google search bar. It’s your job, then, to understand what they’re searching for, and how you can become their best solution. 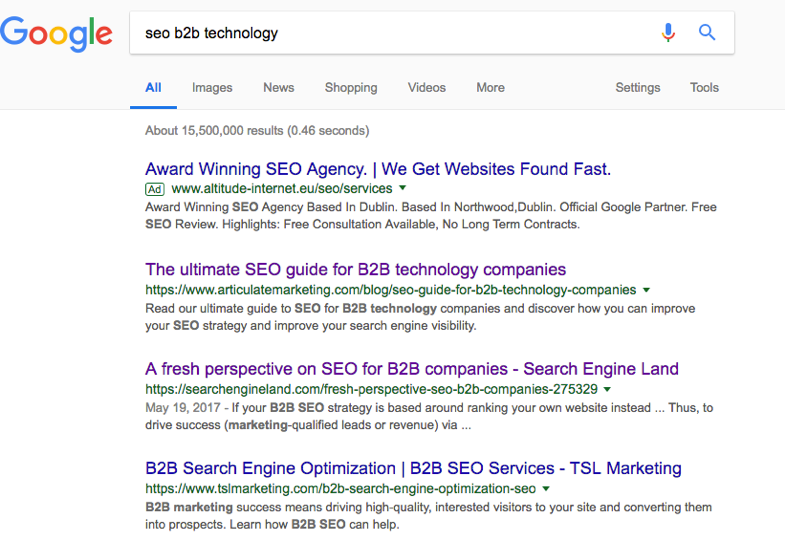 Here’s how we develop a B2B SEO keyword strategy for our clients at Articulate. Of course, your potential customers aren’t the enemy, but the point still stands. Walk a mile in their shoes. Follow the breadcrumbs. Find the source. Whatever you have to do. For a strategy to work well, you’ve got to dedicate time to lay the foundations. Prepare your strategy includes doing research into who your target audience is and what they’re trying to find. Turn to places like LinkedIn, Ahrefs and your CRM database to better understand what sort of people are engaging with your industry. If you can think like your reader (ie your potential customer), you can begin to narrow down your keyword research and, consequently, tailor your content. Keeping up-to-speed with the content that is performing well in your industry is vital to developing your SEO keyword research strategy. You need to monitor competitors or other businesses within the sector to understand what type of content your target audience engages with. This isn't to say you should copy others, exactly. But it will give you an idea about the types of content you need to produce to be successful. There are many more tools here. In truth, the developers at Google struggle to understand how their algorithms and AIs determine indexability. Sure, people like Brian at Backlinko have outlined the 200 ranking factors, but how these 200 factors prioritise content is still a mystery. But, when you discover a process that works, it should be repeated. For example, we recently published ‘The ultimate SEO guide for B2B technology companies’ on our blog. It’s a 7,000-word pillar page (find out more about pillar pages here) that’s chock full of information about every aspect of SEO, from website SEO to technical SEO. Right now, we’re about to begin work on the next Articulate pillar page. It’ll follow the same process. It’ll have the same level of optimisation. It’ll be written to the same standard. And in theory (depending on the targeted keyword attributes) it should perform just as well. Modern SEO looks like this. Make sure your ideas about SEO aren't outdated. Repeat what works, but never stop trying new things. Marketing is about experimenting, so you should always be testing and improving your process. Sure, we’ll adopt the same practice when producing our second pillar page as we have our first, but we’ll also make changes and A/B test the two pillar pages against each other to see what’s working better. Armed with this data, we can begin to narrow down just exactly what Google is looking for, so that we can give ourselves the best chance of indexing well. While developing your SEO keyword strategy is important, you need to remember that it’s only a small piece of the SEO pie. A website with a high domain authority, for example, will have a better chance of indexing well for keywords that are more competitive than a website with a low domain authority. But domain authority (ie how authoritative Google deems a website to be) is affected by all sorts of things. These include a website’s backlink profile (the amount of links a website has linking to it) and a website’s UX and page speed.